Yep. It’s true. Writers may, unfortunately, use a dash when they are in a rush, and don’t have, or don’t take, the time to complete a thought. In fact, one dictionary definition for “dash” is “move with haste; rush….” While the writer may suppose that the reader will complete his or her thought, or will “know what I mean,” this supposition can be dangerous territory. The reader may very well complete the writer’s thought – with thoughts of his or her own – and totally negate whatever point the writer had hoped to make. Or maybe, and probably more likely, skip along, giving that incomplete or unsupported nascent idea no recognition or thought at all. The dash is an interruption of your sentence’s smooth flow. That’s why it’s often used for emphasis – because its interruption causes your reader to stop and think, even for that split millisecond. But use dashes economically; too many interruptions can be confusing, and defeat your purpose for using them. The dash can work in two areas: clarity, and style. As you saw above, not all sources agree on what the dash should look like, and not all keyboards are the same. Writing is a visual art. I prefer the space-hyphen-space (the final one above), but you may choose whichever “looks right” to you. Just remember (1) to be consistent; and (2) to avoid over-use in your writing – more like pepper than salt! Now: As for the hyphen. Here’s where we have some definite grammar rules, along with some indefinite authoritative differences of opinion. The dash and the hyphen each have a different job. The dash is often used to “split” or separate, or to emphasize large pieces of a sentence. The hyphen is more of a connector, or disconnector of individual words, or word parts. My red-haired sister and I went swimming. Don’t miss this last-chance opportunity. This opportunity provides your last chance. • And not when each of the two words is a stand-alone word, e.g. Augusta was a cranky old lady. He is a pleasant young man. • Use hyphens for ex-spouse; sister-in-law; and great-uncle. These are the most common hyphenated and non-hyphenated words. But then there are those other, less-common words, the exceptions, and the surprises, where you cross your fingers, open the dictionary, and hope you get it right! Bring Gail to your workplace for an onsite workshop, coaching, or consulting. Or to work with your team to complete a writing project. It’s not always – in fact frequently not at all – what you say, but how you say it. I got thinking about this the other day, and how much difference it makes in the way you may feel about the people you could buy products or services from. And more to the point, how our prospects, customers, and clients might feel about us, as people they could buy from, or hire. 1. First, ask yourself how this person – especially if he or she is a prospect, customer, or client – wants to communicate with you. By phone, by fax, by text, by email, person-to-person? I recently telephoned two professional services providers, accepting their proposals, and requesting a start date. Neither returned my phone calls. When I texted them some days later, I had answers back from each in a matter of minutes, where voice mails had gone unanswered. 2. Second, the order of the words you say it in makes a difference. After you’ve selected the medium, focus on your purpose, and start with that in the first paragraph. In the above example, had the purpose of a text message, or a subsequent email been to apologize, that would be the place to start. If the focus of the communication were to move on and get the job done, that would be the place to start. 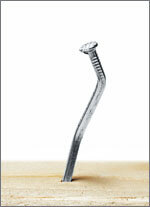 a. Can’t you tell whether the nail’s defect was caused by improper handling during the manufacturing process? b. Can you tell whether the nail’s defect was caused by improper handling during the manufacturing process? It’s a matter of tone – the relationship the writer sets up with the reader. Does it seem to you that the word “Can’t,” in this example, sets up a confrontational tone? Do you almost expect the words “you dummy” to either precede “Can’t,” or maybe end the sentence? If this sentence were addressed to you, would you feel challenged, like you had to defend yourself and explain why you could, or could not, “tell”? In contrast, how do you feel about “Can”? Does “Can” have more of a teamwork feel to it? Which of the two sentences would make you feel more a part of the team working together to find the solution? Can you tell whether the nail’s defect was caused by improper handling during the manufacturing process? Can you tell whether the nails’ defect was caused by improper handling during the manufacturing process? Can you tell whether the nails’ defects were caused by improper handling during the manufacturing process? In this case, we have multiple nails with multiple defects. What a difference that little apostrophe can make. This week, we’re welcoming blogger Marilyn Tycer. Marilyn is a graphic designer and blogger, and we’ve asked her to share some of her tips for bloggers. Tip #1: Make it readable. 2. Use the grammar checker. Make sure you understand what it’s trying to tell you. 3. Leave some time between inputting the material and proofreading it. Overnight is good. When possible, try to schedule proofreading when you’re fresh, and there are the fewest distractions. There’s a lot more to your word processing program than just spell checker! Go to File > Properties > Statistics. This will give you Date Created, Date Modified, Printed, Last Saved by, Revision #, Total Editing Time, and Statistics: Pages, Paragraphs, Lines, Words, Characters, and Characters with Space. National Punctuation Day, established in 2004 by journalist Jeff Rubin, is a day to recognize one of the most underappreciated and most inappropriately used aspects of language: punctuation. In honor of National Punctuation Day, the Huffington Post created a punctuation quiz. Click here to test your knowledge.